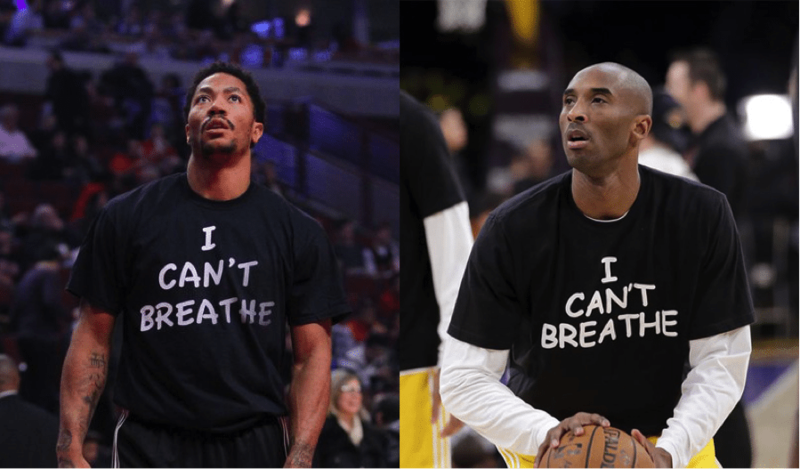 On Saturday December 6th, Chicago Bulls player Derrick Rose initiated a particular form of public protest and solidarity when he wore a shirt emblazoned with the phrase “I CAN’T BREATHE” before the Bulls’ game against the Golden State Warriors. This conception of the pre-game shirt as a nationally televised platform for social activism has since spread through the NBA to multiple teams and high-profile players such as Kobe Bryant and LeBron James. As the shirt idea grew in popularity, its design evolved and its font changed. Its most visible manifestation (worn by James, Bryant, and The Lakers) has received an overwhelming amount of criticism on Twitter and other social medias for one fact alone: its use of Comic Sans. Designed to imitate comic book lettering, the font released by Microsoft in 1994 has since the early 2000s wildly held a position of cultural contempt; it is the one typography joke everyone can make. Most of the criticisms aimed at the use of Comic Sans for this particular message stop at an immediate dismissal, one often expressed in the self-congratulatory tone of proud typographical recognition. Those who articulate their critiques attack the decision as one not fully considered, commenting on the font’s lack of sincerity and seriousness. I don’t think this choice of Comic Sans is an accident. Its understood reception is too engrained in our culture for that to happen on this scale. Look at the line spacing difference between the shirts worn by Rose (the first design) and Bryant (the later iteration with Comic Sans). The lines on Rose’s shirt have more room to breathe. This is a phrase used in design, a part of the language of typographers and graphic designers. The lines on Bryant’s shirt are cramped; they have less physical space between them. They literally don’t have enough room to breathe.This is a significant and intentional difference, one that allows us to read more into the latter shirt’s font. As a typeface, Comic Sans is effectively ostracized from graphic design. If a designer uses Comic Sans, he or she does so understanding its widespread associations and reactions. This often manifests itself as irony; Jesse England’s widely publicized Comic Sans typewriter, the “Sincerity Machine,” is one recent example. A negative conception of the typeface is deeply engrained in cultural experience. Errol Morris, filmmaker and essayist, conducted an online experiment in 2012 that showed individuals are slightly less likely to believe the validity of statements displayed in Comic Sans. These unconscious typographical prejudices have a resonance, however tenuous, with issues of racial bias. The “I CAN’T BREATHE” statement, a rallying cry that came to popularity in the aftermath of a grand jury decision not to indict the officer that killed Eric Garner, protests against a system that is broken. To effectively make this form of critique, the message cannot be conveyed using the existing tools and methods of the system itself. In this case Comic Sans becomes the ideal messenger. The tendency to dismiss it is culturally embedded. Comic Sans is used here not in irony, but as a mirror to the real issues at hand; our dismissive reactions to the typeface come from the same societal forces that engender a sense of apathy in the face of otherwise important messages. In dismissing Comic Sans, we are forced to understand our dismissal of the real issues. Its use exposes this fact, and forces us to confront it.